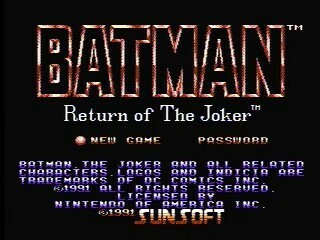 Relased by Sunsoft in 1991, Batman: Return of the Joker is the company's second Batman based game on the NES. As the title suggests, the Joker is on the loose again, and in classic comic book fashion, Batman is the only one who can stop him. Like any good second installment, Batman has a variety of new weapons and gadgets to help him out as he tries to find a more effective means to stopping the Joker than throwing him off a building. Best time: 0:13:40 by Josh 'Funkdoc' Ballard on 2013-03-10. Of any game I've run, this one definitely had the most wasted potential as far as speedrunning goes. There's a nice variety of weapons, charged shots that are a lot more unique than your standard Mega Buster, and the coolest slide in any game. However, a couple of the weapons are completely useless compared to the others, the game is ~80% autoscrollers and boss fights, most of the boss fights are pure mashfests, and even a lot of the platforming areas don't give you the space to use the slide to its potential. Simply put, this game could have perhaps been on the same level as the original Batman if it weren't for the sheer laziness of its level & boss design. Stage 1 – The very beginning of this game is the kind of thing I wish you could do more of – rapid series of slides to barely dodge obstacles. The rest of 1-1, on the other hand, is the kind of stuff that bugs me about this game – forcing you to wait for platforms, not allowing you to use slides, etc. You can't hit the gargoyles when right next to them, so unfortunately walking and shooting is better than sliding. General stuff: The slide is a bit tricky to control. The fastest & farthest slide can only be performed by pressing straight down and A, as if you hold diagonal down/forward at all you'll get shorter slides. The NES dogbone pad makes it especially easy to get accidental diagonals, so I had to pay close attention to this. You also have to be crouching for a couple frames before you can slide, which is annoying when you need to do one ASAP. As far as weapons go, the wave gun (N) is the best option for the early game because the bosses stand still a lot, allowing you to rack up incredible damage by mashing when close to them; it does more damage per hit than the S or B weapons (when both sides of the wave hit, that is), and obviously has a far higher firing rate than the C weapon. Finally, the silly technique I mentioned earlier is as follows: on the screens that say "STAGE 1-2" and such, you can make each of them disappear at least a second faster than normal by mashing A/B/Start/Select all alternately. It saves around 17-18 seconds over the course of the game and singlehandedly shifted my mindset from "sub-14" to "I'm going to beat the Youtube run". Back to stage 1...autoscrollers need no explanation, although I do appreciate this game's animation quality and the playaround material it gives you! The boss is trickier than he looks because you can't get full damage from the wave gun if you stand too far away or even too close to him, but not all that bad in any case. Stage 2 – The easiest stage overall, with some decent platforming and not much else. One thing worth noting is that when you slide off a ledge, you drop straight down; there is a TAS trick to get around this somewhat, but there's hardly anywhere you can do anything useful with it. The switch to the C weapon enables me to reach the rising platform faster and use its charged shot to get rid of the annoying guy to the left(who will otherwise fire bullets that will stop you for a bit). Stage 3 – Hands down my favorite stage, and what I wish the rest of the game would have been. This and the final stage are the only two without any autoscrollers, but this one offers far more interesting movement options. 3-1 in particular offers quite a bit of open space, with enough enemies to make using the slide challenging but doable. This can actually still be improved a bit further if you slide over pits like the TAS does, but that is quite difficult for very minor savings. The key part of 3-2 is having the health to take that one hit on the barrel guy, as he & the falling rocks cost you a lot of time if you can't do that. This boss is the worst one when it comes to mashing, as it has a lot of HP and spends a decent amount of time where you can't get the full damage from the wave gun. Stage 4 – The polar opposite of the previous stage, this one is almost all autoscrollers without much else to say. The boss fight, however, is pretty interesting. The TAS sits in the right corner and bounces the C (Crush?) gun's shots off the wall to repeatedly hit the boss, but I opt not to try this here. The problem there is that when the boss is in the middle of the screen, it's a random 50/50 whether it will move left or right when hit, and you need the boss to stay on the right for this loop to work; for whatever reason you can't bounce C shots off the left side. The strategy I came up with here is far more consistent and only loses a few seconds compared to the best luck I've gotten with the TAS strat. Stage 5 – After stage 3, 5-1 is the other part of this game I really enjoy running. With plenty of slides and some close jumps, this again makes me think about what this game could have been. Mostly self-explanatory, but I stop to kill the one knife thrower because he'll throw a knife that WILL hit you if you just keep moving forward. Oh yeah, and the shmup sections of this game are pathetic once you know about the charged shots. Stage 6 – Another stage with not much to it besides autoscrollers and a boss! At least I finally get to make use of SUPER BATMAN. For those who don't know, some enemies drop icons that look like orbs, and those build up the "B" meter below your lifebar. Once you pick up 8 orbs, Batman turns gold, becomes invincible, and shoots a constant stream of fire without pressing anything. I use the invincibility to slide through a bunch of laser gates that are normally guaranteed to hit you at least once. I have seen other players use this for the beginning of stage 7 instead, but I find that this saves more time overall since the damage you take in 7 doesn't really cost you time. As for the boss, this strategy was also my own discovery and 10+ seconds faster than anything I could manage with the wave gun. It's the only boss fight I find interesting, as there is execution to getting the charged shots off ASAP and the boss has a bit of randomness in its firing pattern. Stage 7 – At least they didn't end the game with autoscrollers! This is a much simpler stage than 3 or 5, though, so again there isn't much to say. The final boss strategy is such a fitting way to end it all, though. Thanks go out to Aglar for his excellent TAS and help in understanding how the slide works (among other things), cranium for his Youtube speedrun (turbo or not, it still had plenty of useful strategies), and Shadow Ninja 64 for initially suggesting I try the C gun on the stage 6 boss (which also indirectly led to my new stage 4 boss strategy). If you enjoyed this run and you're a fan of retro game speedruns in general, check out my stream at http://www.twitch.tv/SRKfunkdoc for speedruns on all kinds of old-school stuff. I also link a lot of other great speedrun streams on that page, so spread the love!